If you’ve heard it once, you’ve heard it a million times: drinking more water is the first step to optimal health. Staying hydrated is a magical way to keep your body in check and take care of your basic functions. You’ve probably also been told that drinking a certain amount of water a day will lead to the perfect complexion we all dream about. But we need to relearn a few of the things we’ve been told. Well, yes, but this isn’t some voodoo magic where drinking more water immediately begins to shrink fat cells. (Scientists, can we get on that?) Instead, this is a pretty obvious phenomenon. Researches have found that drinking a glass or more of water before a meal will fill your stomach up making you eat less when you sit down to dig in. It is also true that feeling hungry and feeling thirsty send the same signals to our brains. So staying consistently hydrated throughout the day will reduce the amount of times we feel the need to snack. The other piece of this is almost too obvious to mention, but I will, because we could all use the reminder: choosing water over soft drinks is one of the best ways to curb calories and lose weight. Dehydration is a leading cause of headaches, causing blood volume to drop and less oxygen to flow to the brain. The decreased oxygen and electrolytes in the brain produce pain signals resulting in different types of headaches. Some may recognize this sensation as a hangover, but migraine sufferers and others can be more sensitive to dehydration and experience this without drinking a bottle of wine the night before. Staying properly hydrated throughout the day is one of the best ways to be proactive in warding off unwanted headaches. 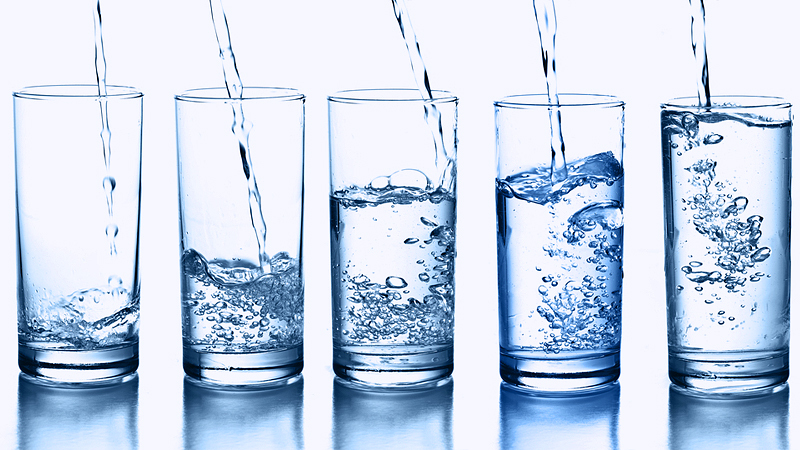 While drinking water does work to flush out the toxins that clog our pores and cause acne, the idea that drinking more than 8 cups a day makes your skin look young and fresh is ultimately not true. Sure, dehydration can lead to drier skin but once you’re taking in a good amount of fluids, drinking even more isn’t going to help your complexion. Instead of surging straight to clearing up our faces, the excess water will be filtered through our kidneys as waste. The most important thing to pay attention to for flawless skin is external factors like cleansing routines and exposure to damaging sunlight. Keep drinking adequate amounts of water but don’t expect it to seep through to the outer layers of your epidermis and smooth out problem areas.